Medium Size: Dragonborn medium sized creatures and have no special bonuses based on size. Speed: Dragonborn have a base speed of 30 ft. Scale Color. A dragonborn's scale color determines its elemental affinity. Below is a list of the most common colors though a player may use them as a baseline to design their own with GM approval. Brass and Green dragons gain immunity to magical sleep and +2 to any save made vs and enchantment spell. Educated: Dragonborn get a +2 racial bonus to Knowledge (Psionics) checks. 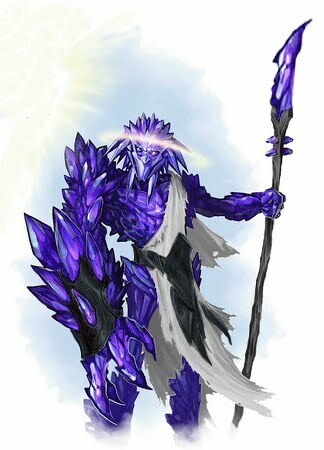 Dragonskin Dragonborn receive a +2 racial bonus to AC due to their crystal hide. Immune to Dragon Fear Dragonborn are immune to a dragon’s frightful presence. Keen Senses Dragonborn receive a +2 racial bonus on Perception skill checks. Languages Telepathy Common and Draconic. with high Intelligence scores can choose any of the following: Dwarven, Elven, Giant, Gnoll, Gnome, Goblin, and Orc. Names: Amata, Arshaka, Arwia, Balashi, Bashanu, Belessunu, Dipana, Erishti, Eshunu, Hunzu, Iltani, Ishmea, Kuaya, Kubaba, Kuri, Manishtu, Naram, Nuraya, Seluku, Tabni, Ubashu, Utua, Zakiti.